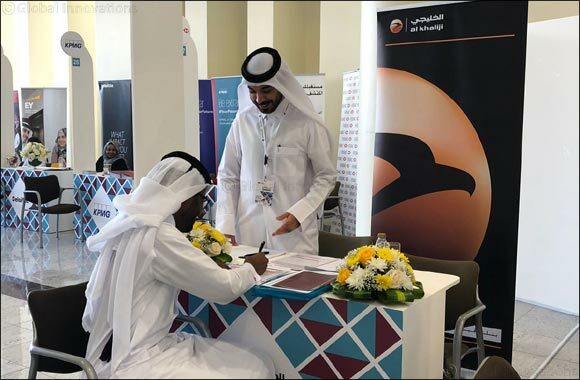 Doha, March 7, 2018 – Al Khalij Commercial Bank (al khaliji) P.Q.S.C., Qatar’s next generation bank, had participated in the 2018 edition of Qatar University’s (QU) annual Career Fair, which was kicked off on March 5th at the University’s premises. al khaliji’s participation comes in the framework of its Qatarization strategy, and goals in line with the Bank’s social responsibility towards Qatar’s next generation. Acting as a platform for nurturing and developing young Qatari professionals in the banking and finance sector is an integral part of al khaliji’s recruitment strategy, which has been designed to dovetail with the Qatar National Vision 2030 and its focus on human capital development, as its main engine towards building a knowledge-based economy. al khaliji’s participation at the QU Career Fair is part of the Bank’s wider human development and capacity building program, which aims to power its network of branches with the best-in-class staff and banking professionals, while raising the bar for the banking and financial sector in Qatar as well as the region. In its 12th year, the QU Career Fair is expected to attract a huge base of promising talents and candidates that are poised to fill different roles in al khaliji and other leading institutions in Qatar. al khaliji offers scholarships for promising young university students at Qatar University, who are guaranteed employment with the bank after completion of their degree. al khaliji is hoping to attract talented Qataris with the bank’s financial incentives and professional development opportunities.